How do I mark a guest as optional? 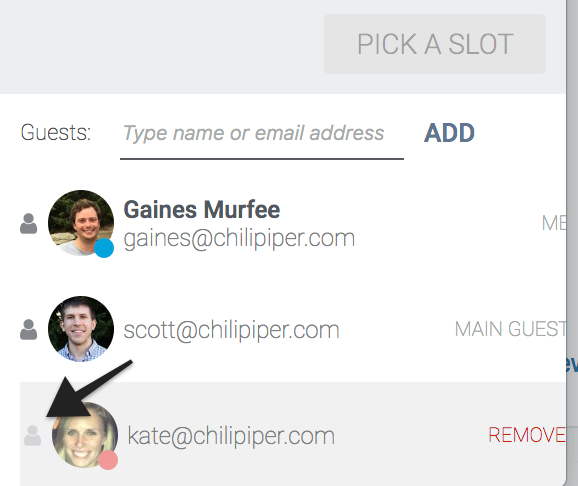 It's easy to mark a guest as optional when booking a meeting via Chili Piper. Once you have opened the Chili Piper browser extension and have added guest to the meeting, simply hover over and click on dark grey the person icon. Once clicked, notice that the icon becomes light grey. This indicates that you have marked the guest as optional. To remove optional status, simply re-click the icon and it will become dark grey again. When the guest is internal and you have access to their calendar availability, the optional guests' availability will not be shown in the Instant Booker UI.